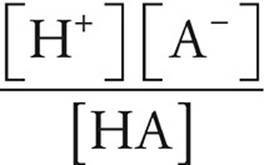 When a weak acid (often symbolized with HA) is placed in water, a small fraction of its molecules will dissociate into hydrogen ions (H+) and conjugate base ions (A−). Most of the acid molecules will remain in solution as undissociated aqueous particles. The dissociation constants, Ka and Kb, are measures of the strengths of weak acids and bases. Ka and Kb are just the equilibrium constants specific to acids and bases. The greater the value of Ka, the greater the extent of the dissociation of the acid and the stronger the acid. The same thing goes for Kb, but in the case of Kb, the base is not dissociating. Instead, it is accepting a hydrogen ion (proton) from an ion. So, a base does not dissociate- it protonates (or ionizes). If you know the Ka for an acid and the concentration of the acid, you can find the pH. For instance, let’s look at 0.20-molar solution of HC2H3O2, with Ka=1.8 × 10−5. First we set up the Ka equation, plugging in values. Because every acid molecule that dissociates produces one H+ and one C2H3O2−. and because, strictly speaking, the molecules that dissociate should be subtracted from the initial concentration of HC2H3O2, [HC2H3O2] should be (0.20 M − x). In practice, however, x is almost always insignificant compared with the initial concentration of acid, so we just use the initial concentration in the calculation. Now we can plug our values and variable into the Ka expression. Now that we know [H+], we can calculate the pH. This is the basic approach to solving many of the weak acid/base problems that will be on the test.